Wine has become more and more a daily beverage for a lot of us. However, there is still somewhat of a mystique about wine. We all have a lot of questions from wine etiquette to food pairings. The problem is who do you ask? Our wineknows have been in the wine and spirits business for a combined total of more than 100 years, and we hear the same questions over and over. When people walk into a wine store, there are thousands of selections to choose from, where do you start? When you go to a nice restaurant and the server hands you the wine list, what do you choose? If my favorite wine is $25 less on the wine list than the one being recommended by the wine steward, does that mean that my favorite is not as good? Our class is a fun interactive program that will answer these questions and a hundred more. The program is not stuffy, boring, nor overwhelming. 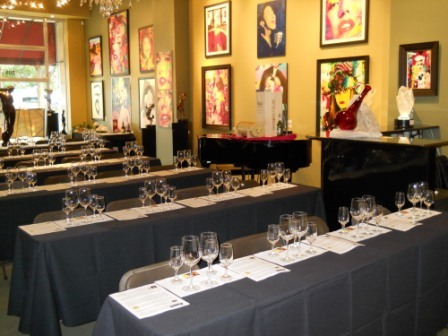 We drink wine, socialize with the people around us, and learn more in two hours than most knew before they arrived. THE PROGRAM The program lasts two hours, during which you will sample six different items. Since not everyone arrives at the location and is ready to sit down at the beginning, we start with a full glass of a fun wine or sparkling wine that everyone will like. You receive this glass as you walk through the door. We start the actual program 15 to 20 minutes after the posted time. Once everyone is seated we make any announcements that the group or organization requires, introduce the program and the speaker, and get started. First we talk about the wine that we poured as everyone arrived. While we are doing this we are pouring the second wine. The entire program is very informal and laid back. We encourage the guests to ask questions at any time. This will prompt others to get into the program and ask questions of their own. After the second white wine, we take a short break. Then we pour two red wines and a specialty wine. The last item is usually a desert wine or specialty liquor. All wines served are included in the price of the program, or are free of charge if the event is a charity or fund raiser. Please remember, the wines are purchased on your behalf before the event from a licensed retailer. A Wine Know wants to teach you more about wine in a fun, interactive way. We do not offer wine for sale. The entire program consists of one full glass as people enter, two 2 oz. pours of two different white wines, two 2 oz. pours of two different red wines, and lastly a 1 oz. pour of a specialty wine or liquor. We usually have extra wine and do allow someone to get a second “taste” of their favorite if there is any left. Please remember this is a tasting and not a drink fest. You will consume two to three 5 oz. glasses of wine in a two hour period. We are very conscious of our guests and our responsibility to them. If you feel that you have had too much to drink, please make your host aware. In the event that one of our guests feels unsafe to drive, or we feel that they are unsafe to drive, transportation will be arranged at no charge to you. The great thing about this kind of event is the fact that you will learn a lot, have a great time, and taste wines that you may have never heard of. There are thousands of different wines out there; we will taste some you like as well as some you probably won’t like. Trying new wines in a fun relaxed setting is the way to find a new favorite and learn how to find wines that are in the category that you like when you go to the store or your favorite restaurant.